The Miami Dolphins were in the playoffs for the first time in five years as they hosted the Kansas City Chiefs at Joe Robbie Stadium on January 5, 1991. In their 21st season under Head Coach Don Shula, the Dolphins placed second in the AFC East with a 12-4 record, good enough to grab a Wild Card spot. 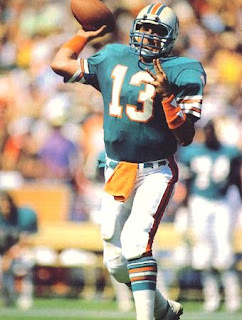 RB Sammie Smith brought a much-needed ground-gaining element to the offense, which had been too dependent on the outstanding passing of QB Dan Marino (pictured above). The defense, which contained an established star in LB John Offerdahl, was also tougher and benefited from the added presence of veteran CB Tim McKyer. Kansas City, with Head Coach Marty Schottenheimer for the second year, finished second in the AFC West at 11-5 to secure a Wild Card spot and reach the playoffs for only the second time since 1971. 36-year-old journeyman QB Steve DeBerg had an outstanding season and running backs Christian Okoye and Barry Word paced the running attack. The defense, anchored by LB Derrick Thomas, was opportunistic and led the NFL with 60 sacks. There were 67,276 fans on hand for the late Saturday afternoon Wild Card Playoff game. 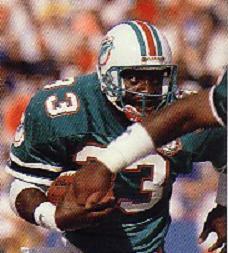 The Dolphins reached midfield on their first drive but, after Marino was sacked for a loss on third down, Reggie Roby’s punt was blocked by CB Charles Washington and the Chiefs gained possession at the Miami 37. Kansas City drove 28 yards in nine plays that resulted in Nick Lowery kicking a 27-yard field goal. Miami responded by driving 40 yards, with Marino completing a pass to WR Mark Duper for 12 yards to convert a third-and-four situation, but the opening period ended with the series stalled at the KC 40. On the first play of the second quarter, Pete Stoyanovich (pictured at left) kicked a NFL playoff-record 58-yard field goal to tie the score at 3-3. The Chiefs came out throwing on their next series as QB Steve DeBerg connected with WR Stephone Paige for 33 yards and WR Robb Thomas for another 15 yards to the Miami 37. But after advancing to the 30, a DeBerg pass was intercepted by SS Jarvis Williams to end the threat. The teams traded punts before the Dolphins drove to the Kansas City 39 and Stoyanovich again attempted a long field goal, this time from 57 yards. This one fell short and the Chiefs went 61 yards in four plays. 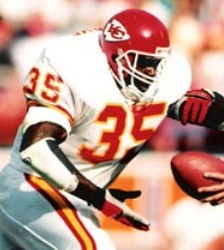 RB Christian Okoye gained 16 yards on the first play of the series and, after a short gain by Okoye, DeBerg threw to Paige, first for 16 yards, and then for a 26-yard touchdown. The Dolphins again advanced into KC territory but Marino was stripped by DE Neil Smith and CB J.C. Pearson recovered for the Chiefs at his own 38. The score was 10-3 in favor of Kansas City at halftime. Kansas City’s first series of the third quarter ended with a punt, but Bryan Barker’s 44-yard kick went out of bounds at the Miami six. Pinned deep in their own territory, the Dolphins had to punt it back, although Roby’s 64-yard kick carried to the KC 30. DeBerg threw to WR Emile Harry for 26 yards but, following a sack and incomplete pass, the Chiefs faced a third-and-15 situation. DeBerg threw a screen pass to RB Todd McNair for 13 yards and, on a fourth-and-two play from the Miami 36, Okoye ran for five yards and a first down. Two more pass completions got the ball to the one yard line, but the Chiefs were unable to penetrate the end zone. An intentional grounding call on DeBerg on a second down play moved the ball back ten yards and Kansas City ultimately had to settle for a 25-yard Lowery field goal. On the first play of the ensuing series, Marino threw to WR Mark Duper for 16 yards, but the receiver fumbled when hit by FS Deron Cherry and LB Dino Hackett recovered at the Miami 29. Three handoffs to Okoye gained eight yards and Lowery kicked a 38-yard field goal to extend Kansas City’s lead to 16-3. Desperately needing to score, the Dolphins converted a fourth down on a two-yard run by Sammie Smith (pictured at right) at the end of the third quarter on their way to going 66 yards in 10 plays. Marino threw to Clayton for 23 yards to reach the KC 11 and three plays later he connected with RB Tony Paige for a TD. With the successful extra point, Miami was down by just six points with over twelve minutes remaining to play. DeBerg threw to Harry on first down, who broke away from Tim McKyer along the sideline and gained 33 yards. But the drive was stopped at the Miami 41 and the Chiefs punted. Starting from their 15, the Dolphins immediately moved into Chiefs territory when Marino passed to TE Ferrell Edmunds for a 37-yard gain to the KC 48. Miami methodically drove down the field from there, converting three third downs and with Marino capping the 11-play, 85-yard series with a 12-yard touchdown pass to Clayton. Stoyanovich added the all-important extra point to put the Dolphins in front by one. With 3:28 left on the clock, the Chiefs still had a chance. Two DeBerg passes got the ball to the Kansas City 47 and Okoye then ran for 26 yards to the Miami 26. However, a holding penalty moved the ball back ten yards (and negated a 12-yard carry by Okoye) and the Chiefs were only able to get back to the 34 before having to try for the winning field goal. Lowery’s attempt from 52 yards was close but short – breaking a streak of 24 consecutive successes - and the Dolphins survived to win by a score of 17-16. The Chiefs outgained Miami (367 yards to 311) although the Dolphins had the edge in first downs (23 to 16). Miami also turned the ball over twice, to one by Kansas City. Dan Marino completed 19 of 30 passes, including ten straight during the fourth quarter comeback, for 221 yards with two touchdowns and none intercepted. Sammie Smith ran for 82 yards on 20 carries. Mark Clayton caught 5 passes for 66 yards and a TD while Tony Paige also caught 5, for 30 yards and a score. For the Chiefs, Steve DeBerg was successful on 17 of 30 throws for 269 yards and a TD with one intercepted. Stephone Paige had 8 pass receptions for 142 yards and the touchdown. Christian Okoye (pictured below) keyed the running game with 83 yards on 13 attempts. Miami advanced to the Divisional playoff round and lost to division-rival Buffalo by a score of 44-34. The Dolphins regressed to 8-8 in 1991 but won the AFC East in ’92. The Chiefs made the postseason in each of the next five seasons under Schottenheimer but failed to gain an elusive championship, advancing to the AFC title game just once in that stretch.